"Some contrived timing puzzles and occasional bugs hold back this otherwise enjoyable sequel." Very nice game, a bit too hard but I enjoyed it ! Seriously enjoyed this game. The music is still in my head as i type, extremely catchy, and the characters are all loveable. Except for a few puzzles which were pretty hard, the game was amazing, with enjoyeable situations and puzzles, with quite a bit of originality. I have enjoyed this game more than many LucasArts ones, and i can say only Grim Fandango and Monkey Island beat it, because it seems like such a professional game because so much care seems to have gone into it. The music, the characters and the dialogue all fantastic, with a bit of humour in there. And a female pirate to go with all this. Bring on Apprentice III, if it is similar to this game it will be nothing short of amazing. Excellent music, almost like orchestral compose. However, i was really annoyed by puzzles. It seems unnecessarily difficult to me. I don't like pixel hunting. I think few people could finish it without looking at walkthrough. As a summary, the game deserves all awards it won except "Best Puzzle". Everybody has to play the Apprentice series! Great work guys, can't wait for the third installment. this was a great game overall. The music, backgrounds, characters, and script were all done fantastic. Some of the puzzles were a bit obscure. Like when you had to get the bucket part from Seacookie? I was playing at 320x200... how was I supposed to see that tiny little brown thing? Most of the puzzles were done well but theres only a couple I thought were stupid. This game has appropriately won 7 AGS awards and you HAVE to play this game. (If you haven't already play Apprentice 1, theres some inside jokes related to the first one in this game). Where the first Apprentice was a fine game that didn't have much of a story and was too short, I find that the sequel is a great game that is longer but still doesn't have much of a story. The puzzles are fine and the graphics are great. The characters are very interesting. And if you don't laugh and have a good time playing this game then you might want to see a doctor as you might be lacking something. This game is funny and fun. One of my favorite AGS games. One of the BEST AGS games ever. Pick it up today! Excellent game; one of the best AGS games I've ever played! I was really immersed in this game - with all its puzzles, catchy music, and superb graphics such as the breathtaking backgrounds. One word: brilliant! Apprentice 2 is a dream come true. It has everything that made the first game great and eradicates the only downside of the original, which was length. The cute, cartoony graphics that made Willowbean so lush are still in place, only this time we get to see a lot more of Willowbean than just the tower and the area directly outside the tower. There are many beautiful locations to explore. The witty dialogue is still there too, only this time round we get to meet a lot more characters who all how their own unique and often hilarious traits. Old favourites Lord Ironcrow, the Highway woman and Lloyd return too. While the first Apprentice felt too short, Apprentice 2 has an excellent game length with some simple puzzles and some very tricky ones that'll keep you guessing for a long time. Not than anyone could object to a long stay in Willowbean. Apprentice 2 is one of the best and most professional AGs games I have played and was rightfully showered with awards. Another classic from Herculean Efforts. This game is truly excellent in almost every way. However, there were SEVERAL puzzles whose solution simply wouldn't trigger until I did other, completely unrelated events, even if I had all the items and information needed to complete them. In a game as relatively non-linear as this, that's nearly inexcusable. That said, as long as you don't mind getting frustrated sometimes (and even possibly having to restart entirely), this is the cream of the crop, and cheers to the designer. This game is absolutely amazing. The intro draws you right into the game! And humor is used very appropriately. Trust me people! This is a game you must download and play because this is the game who will get so many AGS award this year!!!! Overall, I liked the game. I didn't particularly like the inventory GUI, as it sometimes interfered with exiting the screen. A couple of the puzzles annoyed me, but other than that I really enjoyed it. I'd like to see more. Finished just yesterday, and I can only say that it's brilliant - Topping the original on several points, while still keeping the charm that was in "Apprentice". The graphics are cartoony and great, and the puzzles are hard enough to give you something to ponder over at night, while still being easy enough to be solveable without frantic trial-and-error. I had some minor troubles with the GUI at times, but it wasn't enough to bring the overall experience down, though. 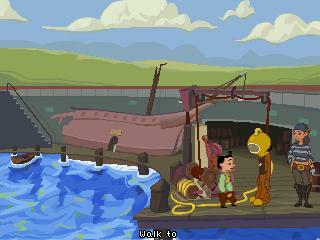 So, all in all, this is how a good amateur adventure game should be made - With passion and a good sense for quality. Hieronimus: The story is not as much about Pib becoming a magician as it is about other things. A Jesus game would be cool. Not a parody, an actual jesus questy quest adventure thingy. The story was there, you are being a bit too critical. Every game needs a motive, a character seeking a particular occupation or rank is less cliche than a character trying to save a kidnapped person. I hope you aren't going to argue that MI was original in that guybrush wanted to be something, but had to prove himself worthy. How about Luke Skywalker becoming a Jedi? How about King Arthur becoming the king? How about Jesus becoming the Messiah? Get over it and be thankful for such an awesome game as App2. AWESOME! This game is even better then most "professionnal" game I ever played! Graphic are beautiful, music is incredibly well done, the plot is interesting... I can't even say a single bad comment about it! I'm looking foward for Apprentice III! To my knowledge we weren't purposefully copying any of those games. Where is the story ? Why can't people like you, who are very talented in arts and computers try to make something new, instead of copying old ideas of classic originals that are always better than any remake ? Why isn't there a voting option for music? The music in Apprentice II is so incredibly good that it needs a special mention.